Welcome back to another post in our Playful Baby series! This year we are hosting a new series about none other than baby play! 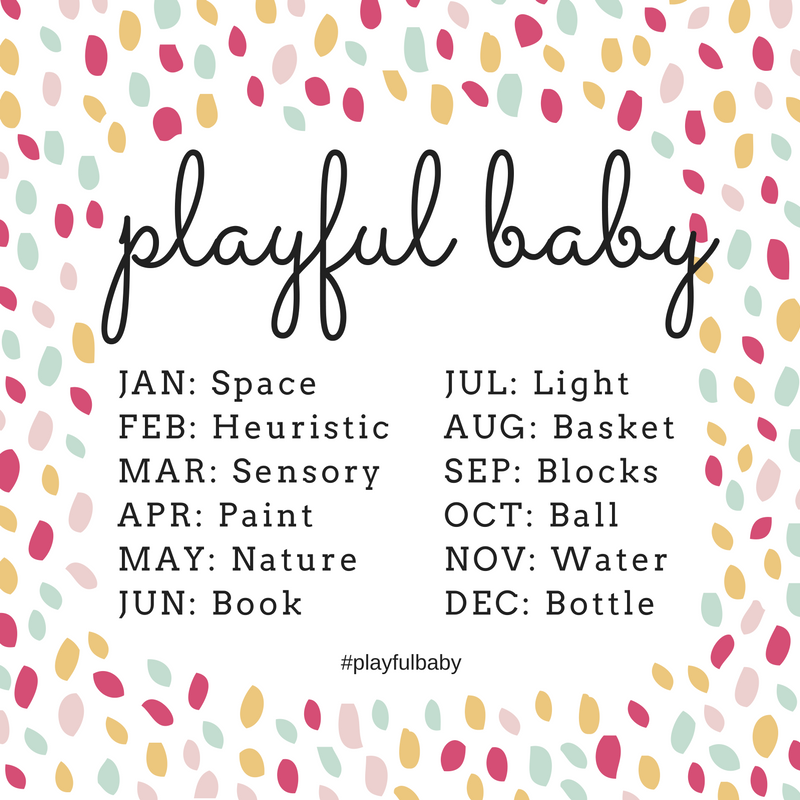 From playspaces to heuristic play and even paint… we want you to feel comfortable playing with your baby. By the end of the next 12 months you will have an arsenal of baby play ideas! You will have the knowledge and understanding to continue learning and growing with your baby through play. 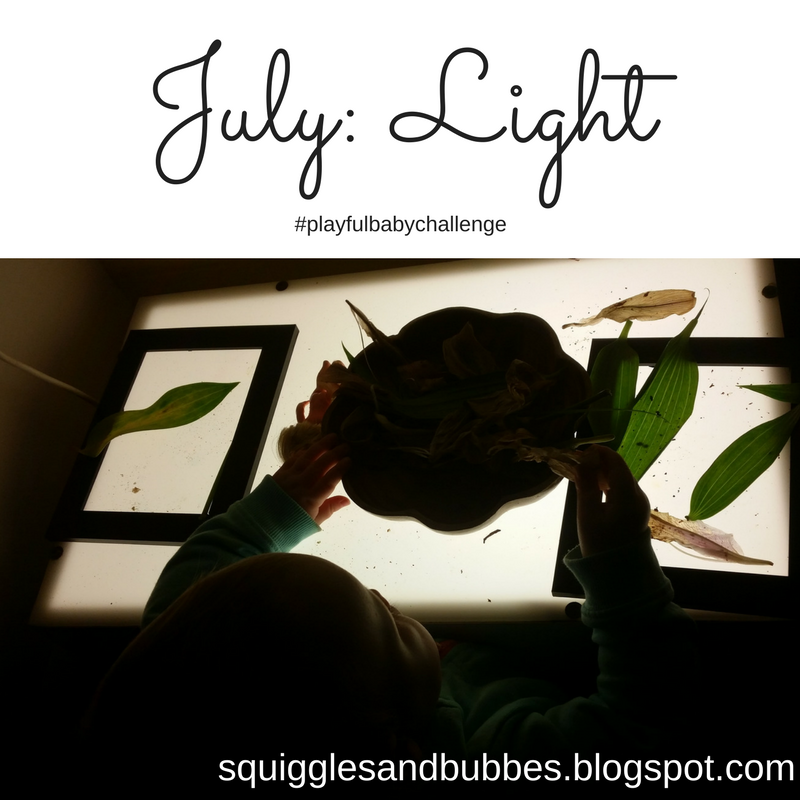 This month we are sharing light play ideas! Light and shadows are absolutely magical to babies and young children. Over the years I've found that simply adding a little bit of light play to an ordinary activity takes it to a whole other level. 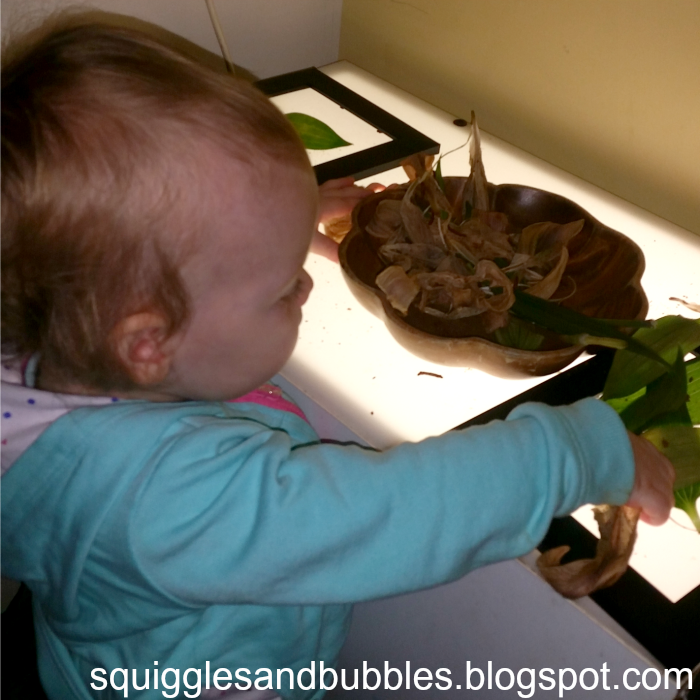 When Bubbles was little we played with duplo, rice, salt, leaves and even just things from the kitchen cupboards on the light table. Adding the light to otherwise ordinary items turned them into almost magical objects. This activity was super easy to set up. 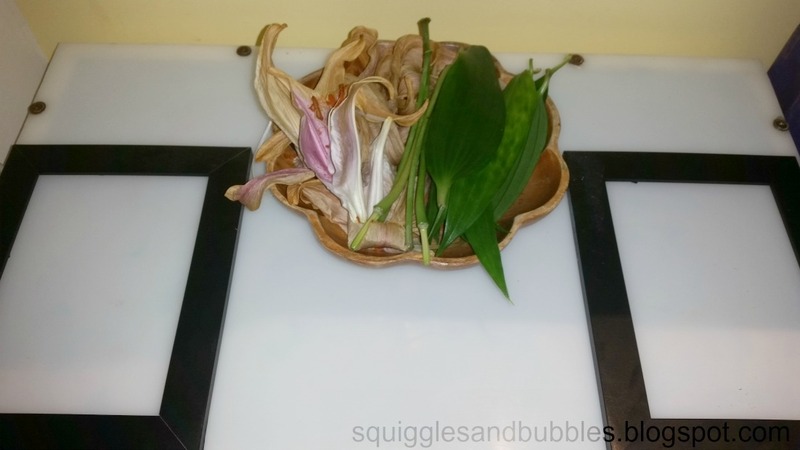 I simply grabbed an old bouquet of flowers that Numnut had given me, separated the buds, petals, stems and leaves, placed them in a bowl on the light table and added two photo frames (minus their backs and glass). 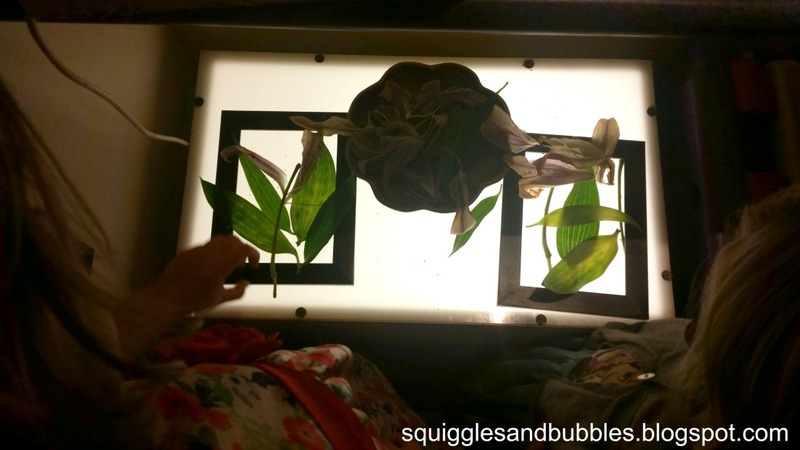 The photo frames were more for Bubbles (6) and Squiggles (4) to establish that two could play at once and define play spaces, if I were setting it up for JB (1) alone I would have just popped the plant pieces on the light table. Next I simply moved away and waited for the girls to show an interest. Squiggles was the first to take an interest. 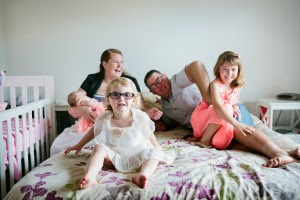 We've previously done a similar activity but with contact paper on the frames, so initially she asked when I was going to put the "sticky paper" on the frames. After being told I wasn't though she immediately started searching through the bowl for a stalk, leaf and flower. Bubbles then joined in making her own beautiful flower creation. JB didn't really show any interest in the invitation until two days later when I turned around to discover her very carefully sorting the plant pieces from one frame, to the bowl, to the next frame and then back again. As she picked up the plant pieces she rubbed them in her fingers...and tried tasting a few though she quickly decided they weren't for eating. She spent a good 5minutes sorting before she decided to clear the whole table and dump the contents on the floor! This month we are giving away a Grimm's Medium Stacking Rainbow. 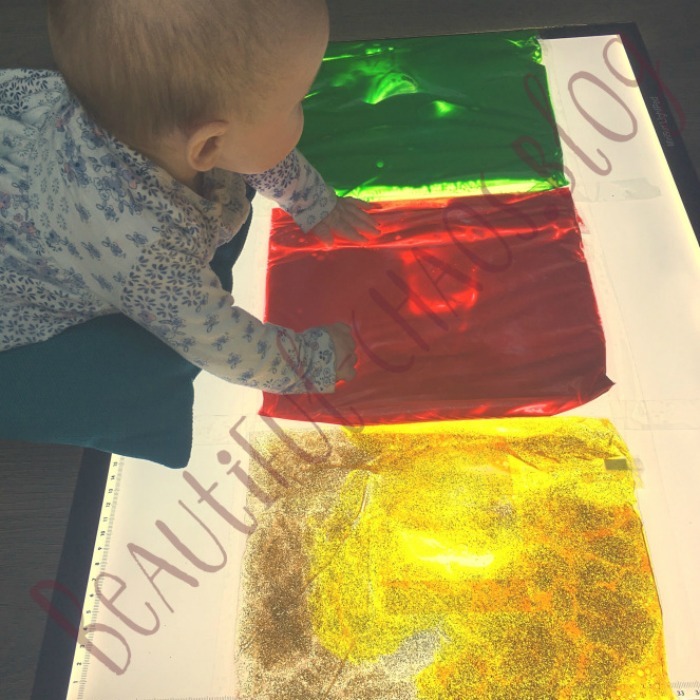 All you have to do is share how your baby reads or plays with light on Instagram (#playfulbabychallenge @squigglesandbubbles @loving_naturally @squishelsandme @mummy_loz @xoxo_beautiful_chaos_xoxo) or on Squiggles and Bubbles' Facebook Page before the 20th of August 2017, for all the fine print click here. If you liked this you may also like Paint Play with a 4Month Old Baby. Just click the picture to read all about it!